Magna Powertrain supplies the all-wheel-drive system for the new Mercedes-Benz GLA. The unit of Canada’s Magna International co-developed the system with Mercedes parent Daimler. Magna Powertrain eliminated seal rings and bearings in the system to reduce drag by about 14 percent and decrease weight by more than 2kg. Magna also supplies the new compact SUV with its transmission oil pump, body stampings, front and rear fascias, rocker panels, radiator grilles, rearview camera as well as various components on the inside including interior soft trim and door inner panels. Assembly of the GLA began on the automaker’s MFA platform in December 2013 at Daimler’s factory in Rastatt, Germany, alongside the A- and B-class models. 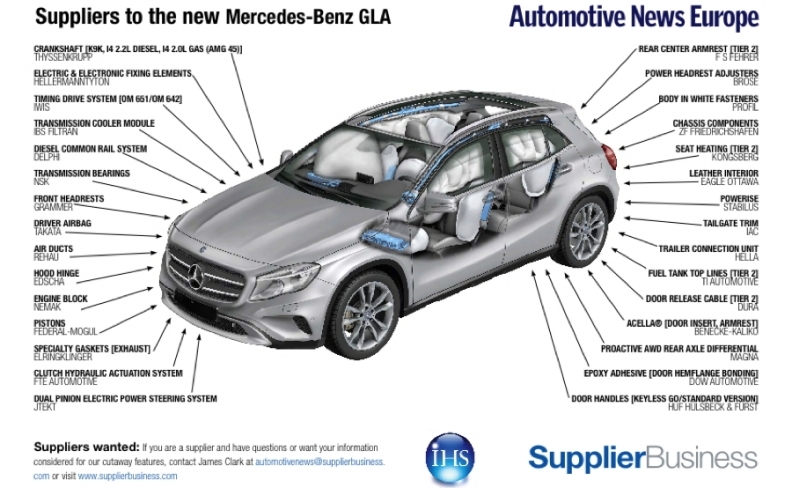 GLA output is due to peak at more than 120,000 units in 2015, according to IHS Automotive production forecasts.